Migraine is a common neurological disease with a complex genetic aetiology. The disease affects ~12 % of the Caucasian population and females are three times more likely than males to be diagnosed. 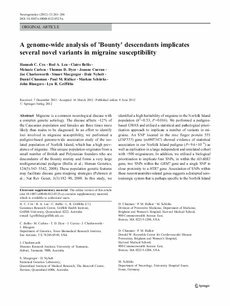 In an effort to identify loci involved in migraine susceptibility, we performed a pedigree-based genome-wide association study of the isolated population of Norfolk Island, which has a high prevalence of migraine. This unique population originates from a small number of British and Polynesian founders who are descendents of the Bounty mutiny and forms a very large multigenerational pedigree (Bellis et al. ; Human Genetics, 124(5):543-5542, 2008). These population genetic features may facilitate disease gene mapping strategies (Peltonen et al. ; Nat Rev Genet, 1(3):182-90, 2000. In this study, we identified a high heritability of migraine in the Norfolk Island population (h2 = 0.53, P = 0.016). We performed a pedigree-based GWAS and utilised a statistical and pathological prioritisation approach to implicate a number of variants in migraine. An SNP located in the zinc finger protein 555 (ZNF555) gene (rs4807347) showed evidence of statistical association in our Norfolk Island pedigree (P = 9.6 × 10-6) as well as replication in a large independent and unrelated cohort with >500 migraineurs. In addition, we utilised a biological prioritisation to implicate four SNPs, in within the ADARB2 gene, two SNPs within the GRM7 gene and a single SNP in close proximity to a HTR7 gene. Association of SNPs within these neurotransmitter-related genes suggests a disrupted serotoninergic system that is perhaps specific to the Norfolk Island pedigree, but that might provide clues to understanding migraine more generally.